There's no limit to what you can build in Minecraft. From a one-to-one scale model of the Starship Enterprise to a working CPU, the block-based video game has seen practically everything. Fans of the game like to spend time on large-scale constructions, and the engineers at Verizon seem to be some of the biggest fans around. 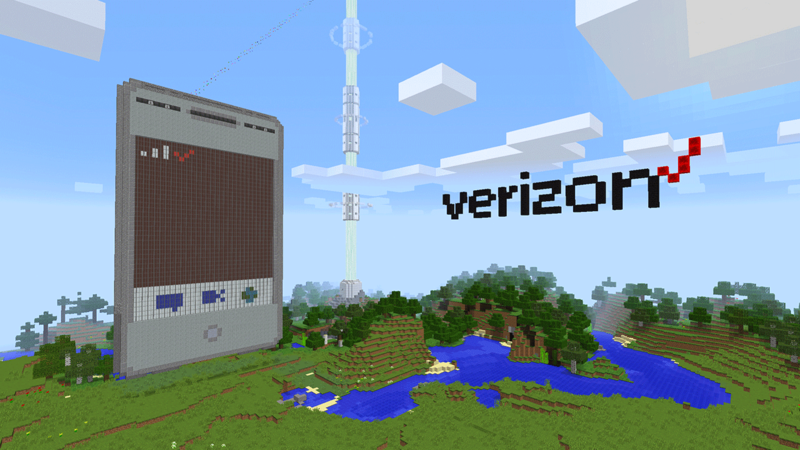 Staying true to what the company is known for, they've taken it upon themselves to extend the network's wireless coverage into the virtual world and build a working smartphone in Minecraft. The result is admittedly very cool. The phone may not have all the conveniences of a modern smartphone: the roughly 2000-inch display has a screen resolution of about 40 by 30 pixels, which gives it a rather lowish pixel density of around 0.0254 ppi. The screen also doesn't seem to support multi- or even mono-touch either. That large display also means the phone is several stories tall — it falls into the larger side of the phablet spectrum and probably won't fit into your skinny jeans. Still, it includes a fully-functional web browser (the low resolution of the display does have a slight negative impact on its usability) and is even able to make two-way video calls to actual phones in our real, non-blocky world. On the upside, mobile coverage is universally available — just plant a cell tower sapling and the game's virtual engineers will come build one for you free of charge. The phone also appears to have one of the longest battery lives we've seen on any device, with at least several billion years of screen-on time before the juice runs out. The project is available on github for anyone who wants to learn more, and although Verizon doesn't offer any way to try out the new phone, it does provide some instructions on how to build one youself.